Sadly, I don’t have HBO, so I can only hope that this documentary–airing tonight at 9pm–will be made available via one of the video rental/streaming services soon. Throughout the land, real life superheroes exist amongst us. They are ordinary people who don capes, masks and alter egos to bravely battle crime, apathy and homelessness, in order to right the wrongs of society. Director Michael Barnett’s award winning documentary “Superheroes” is a profoundly funny, eccentric and inspiring film that chronicles the lives of these extraordinary citizens as they take to the streets to protect and support their communities. From New York to San Diego and everywhere in between, “Superheroes” is the definitive look in to the world of the ever-growing real life super hero community. As a big–albeit, grown up–comic book geek, a part of me still can’t help hoping there are proper superhumans out there, or that the strands of fate will lead someone down the path to becoming a hero. Currently the closest we get to seeing anything like the heroes of our youth is Comic Con. 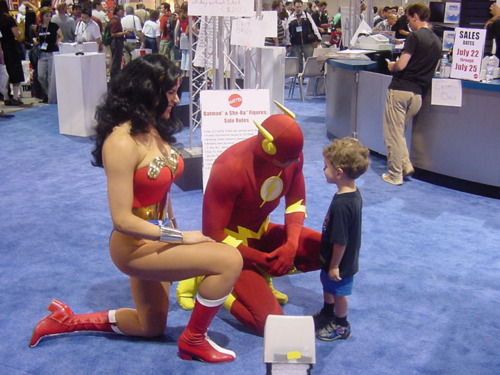 Not that those costumed fans can’t also be heroes to the right person. I’m sure the documentary will be both comedic and heartwarming and frankly, it’s nice to know that people out there care enough about their community to try and make it better. Not that vigilantism is necessarily the best way to go about it, but it’s not as if that’s stopped the Guardian Angels. If real-life pretend super heroes are more your thing, check out Confessions of a Superhero, a documentary about costumed superheroes (actors) on the Hollywood Walk of Fame. The term “Super heroes” is a trademark co-owned by DC Comics and Marvel Comics. No, really. You have got to be freakin’ kidding me.